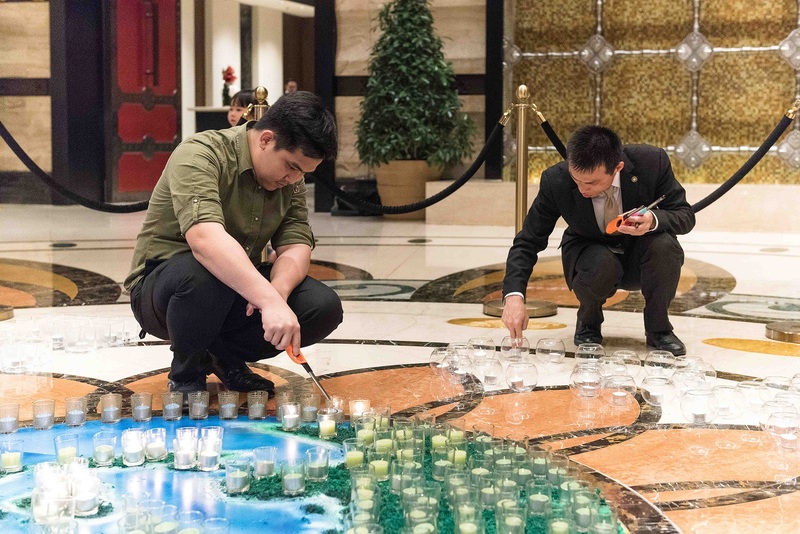 Conrad Macao celebrated Earth Hour 2018 with 543 candles illuminating its hotel lobby. MACAO –March 26, 2018 – Conrad Macao, Cotai Central celebrated Earth Hour 2018 from 8:30 p.m. – 9:30 p.m. local time on Saturday, March 24. The hotel is taking action locally to engage in sustainability efforts – from water stewardship and energy conservation to reducing waste and community projects. In support of action on global climate change the hotel turned off its external façade lights and dimmed all non-essential lighting in its restaurants and lounges, including its crystal chandelier lobby centrepiece. 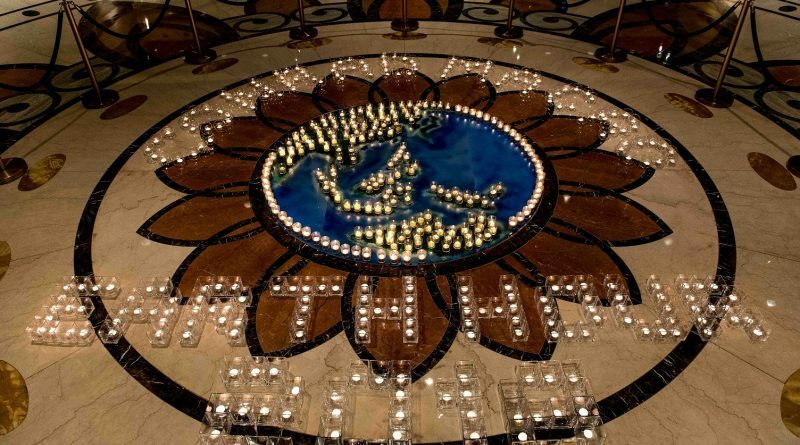 In its place was a spectacular display made up of 313 white tea candles, 180 green tea candles and 50 blue tea candles to form the shape of the Earth, illuminating the lobby and spelling out ‘Conrad Macao Earth Hour 2018’ to demonstrate the hotel’s commitment to Earth Hour, Every Month. The display’s 180 green candles represent the 180 countries which pledged to recognise Earth Hour, while the 50 blue candles indicate other territories which also committed to switch off lights during the celebration. Created by World Wildlife Fund (WWF), Earth Hour began in 2007 as a way for individuals and businesses to show how simple steps can have a significant impact on addressing climate change. The idea was conceived during a WWF meeting held at the Hilton Sydney, Australia. Earth Hour has grown to become the world’s largest grassroots movement for the environment, with more than 180 countries and territories worldwide participating. “Conrad Macao has been working with WWF for the past five years and is again proud to join this meaningful worldwide endeavor to support environmental awareness for the sixth year. Supporting Earth Hour is one of the ways we show our commitment to energy conservation while delivering great guest experiences,” said Bede Barry, General Manager of Conrad Macao. The extended Earth Hour participation began in 2013 when Conrad Macao posed a friendly challenge for other hotels in Macao to join its monthly lights-out as part of Earth Hour’s global ‘I Will If You Will’ campaign. In addition Conrad Macao actively practices green initiatives on a daily basis, and has replaced more than 25,000 light bulbs with LED/energy efficient ones, resulting in savings of over one million KWH. Other energy initiatives include implementing operational efficiency improvements to the hotel’s central chilled water plant, resulting in annualised energy reductions of more than 2.8 million KWH. Hilton (NYSE: HLT) is a leading global hospitality company, with a portfolio of 14 world-class brands comprising more than 5,200 properties with over 856,000 rooms in 105 countries and territories. Hilton is dedicated to fulfilling its mission to be the world’s most hospitable company by delivering exceptional experiences – every hotel, every guest, every time. 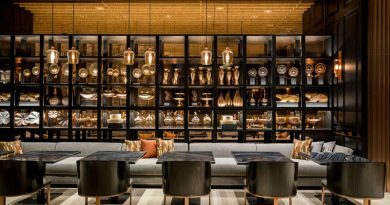 The company’s portfolio includes Hilton Hotels & Resorts, Waldorf Astoria Hotels & Resorts, Conrad Hotels & Resorts, Canopy by Hilton, Curio Collection by Hilton, DoubleTree by Hilton, Tapestry Collection by Hilton, Embassy Suites by Hilton, Hilton Garden Inn, Hampton by Hilton, Tru by Hilton, Homewood Suites by Hilton, Home2 Suites by Hilton and Hilton Grand Vacations. The company also manages an award-winning customer loyalty program, Hilton Honors. Hilton Honors members who book directly through preferred Hilton channels have access to benefits, including a flexible payment slider that allows members to choose exactly how many Points to combine with money, an exclusive member discount that can’t be found anywhere else, and free standard Wi-Fi.